Today, non-Hispanic whites make up 57% of all Democratic and Democratic-leaning registered voters, down significantly from 76% in 1992. By contrast, though the share of GOP voters who are white also has declined since 1992, the change has been much more modest: Currently, 86% of Republican and Republican-leaning registered voters are non-Hispanic whites, compared with 93% in 1992. As a result of these changes, the 17-percentage-point gap between the share of white voters in the Republican and Democratic parties seen in 1992 has grown to a 29-point gap today. The Republican Party – once more youthful than the Democratic Party – has aged rapidly over the past 24 years. In 1992, far more GOP voters were under the age of 50 (61%) than age 50 and older (38%). Today, fully 58% of Republican voters are 50 and older while the share under 50 has declined to 41%. Among Democratic voters, 48% are 50 and older, while 51% are under 50. The rate of aging within the Democratic Party since 1992 (when 57% were under 50 and 42% were 50 and older) has been much less steep than that seen within the GOP. Americans overall are better educated than they were a quarter-century ago, and this change also has had a profound impact on the composition of the two parties. The share of voters who have a college degree or more education has increased by 10 percentage points since 1992, from 23% to 33%. Better-educated voters are increasingly identifying as Democrats and expressing liberal attitudes across a range of issues. Since 1992, the share of Democratic and Democratic-leaning registered voters with at least a college degree has increased sharply, from 21% to 37%. Among Republicans, 31% have at least a college degree, up only slightly from 28% in 1992. As a consequence, a greater proportion of Democrats than Republicans now have a college degree or more education. While Americans remain highly religious, the share of registered voters who are religiously unaffiliated – describing themselves as atheist, agnostic or “nothing in particular” – has increased from 8% in 1996 to 21% today. Here again, the pace of change in religious affiliation has been far faster among Democratic than Republican voters, resulting in a widening gap between the two parties in the shares who do not affiliate with a religion. In 1996, just 10% of Democratic voters were religiously unaffiliated; today that share has nearly tripled to 29%. Among Republican and Republican-leaning registered voters, the share not affiliating with a religion has increased from 6% to 12% over the past two decades. The balance of party identification among all voters tends to change slowly over time. For most of the past quarter-century, Democrats have held at least a slight edge. Currently, 34% of registered voters identify as independents, 33% identify with the Democratic Party while 29% identify as Republicans. When the partisan leanings of independents are taken into account, 48% either identify as Democrats or lean Democratic; 44% identify as Republicans or lean Republican. The Democratic Party’s advantage in leaned party identification is identical to its edge in 2012. However, it has narrowed significantly from 2008 (51% to 39%), the final year of George W. Bush’s administration, when the Democratic edge in leaned party affiliation was as wide as at any point in the past quarter century. The Republican Party has been able to offset Democratic trends in affiliation among many growing demographic groups by improving its standing among older voters – who also make up a larger share of the electorate today – as well as among white voters, men and those with lower levels of education. This has been especially apparent during Barack Obama’s presidency. In 2008, the year Obama was first elected, Democrats held sizable advantages among voters 50 and older. Among those 50-64, 51% identified with or leaned toward the Democratic Party, compared with 40% who identified with the GOP or leaned Republican. The Democrats’ advantage among voters 65 and older was almost as large (49% to 40%). Both groups of older voters are now more Republican than eight years ago. 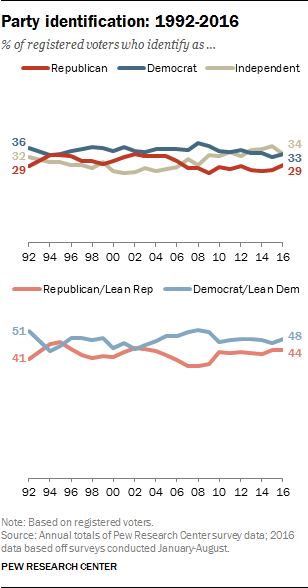 Today, voters 50-64 tilt Republican (48% identify with the GOP or lean Republican, while 46% identify with the Democratic Party or lean Democratic). Republicans hold a wide, 51% to 42% lead among voters 65 and older – an edge that is nine points greater than it was in 2008. White voters – who were roughly divided in their partisan leanings eight years ago – are now much more likely to identify as Republican or lean Republican (54%) than to say they identify as Democrats or lean Democratic (39%). 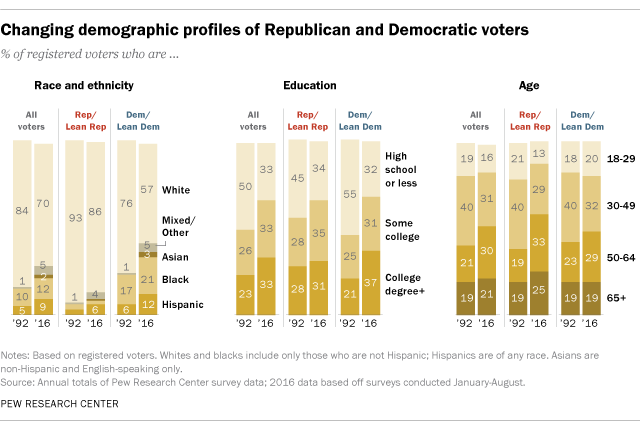 And voters with no college experience – long a reliably Democratic bloc – are now split in their partisan preferences: 46% identify as Republican or lean Republican, while an identical 46% identify as Democrats or lean Democratic. Some of the sharpest movement toward the GOP has come among less educated and older whites. Whites with no college experience have become 14 points more likely to affiliate with the GOP since 2008, including a six-point shift over the last four years. White voters age 65 and older are now 13 points more likely to identify as Republican or lean Republican than they were eight years ago. While the GOP has made gains overall and among key groups, there is no sign that Democratic affiliation is waning among the party’s core constituents. College graduates, blacks and Hispanics are as likely to identify as Democrats or lean Democratic today as they were four or eight years ago. And while older voters have moved increasingly toward the GOP in the Obama era, young voters remain overwhelmingly Democratic in their partisan affiliation. Today, nearly six-in-ten voters younger than 30 identify as Democrats or lean Democratic (59%), which is little changed from 2008 (60%).